Federal investigators say they have booted electric car maker Tesla Inc. from a group that's investigating a fatal crash in California that involved an SUV using the company's Autopilot system. The National Transportation Safety Board said it removed Tesla as a party to the investigation after the company prematurely made information public. Tesla, however, disputed the claim and said it withdrew from the agreement two days earlier, after being told that it would be removed if it made additional statements before the NTSB finished its probe in the next 12 to 24 months. The company said it released information to correct "misleading" claims being made about Autopilot creating safety problems. In a statement about the escalating dispute, Tesla said it would file a complaint with Congress and accused the NTSB of being more concerned with "press headlines" than promoting safety. Removing a party to an investigation is rare but has happened in the past, according to the agency. Companies and other organizations can become parties in a probe because they can give technical help and share sensitive information. 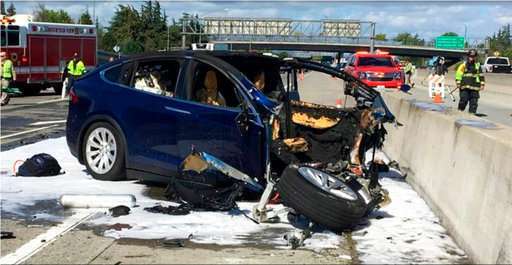 The move means that the NTSB will no longer share information about the March 23 crash of a Tesla Model X SUV on U.S. 101 near Mountain View in Silicon Valley. The driver, Walter Huang, 38, a software engineer for Apple, was killed in the crash. In a statement on March 30, Tesla confirmed that the semi-autonomous Autopilot system was operating at the time of the crash and seemed to blame the crash on Huang. The company said Huang didn't have his hands on the steering wheel for six seconds before the impact and also received several warnings from the vehicle. Shortly after Tesla released the information, an NTSB spokesman said the agency was "unhappy" about the disclosure. Tesla tells drivers that its Autopilot system—which uses cameras, radar and computers to keep speed, change lanes and automatically stop vehicles—requires drivers to keep their eyes on the road and hands on the wheel in order to take control to avoid accidents. The Palo Alto, California, company said its vehicle logs showed Huang took no action to stop the Model X from crashing into a concrete lane divider. The company said the crash was worsened by a missing or damaged safety shield on the end of the lane divider. The NTSB, along with the National Highway Traffic Safety Administration, is looking into the crash, as well as another Tesla crash in January near Los Angeles in which a Model S sedan smashed into a firetruck parked on a freeway. Tesla would not say whether the Model S in that crash was operating on Autopilot. David Friedman, a former NHTSA acting administrator who now is director of cars and product policy for Consumers Union, the advocacy arm of Consumer Reports, said the Tesla-NTSB spat could delay the investigation if the agency doesn't have all the electronic information it needs from the company. The agency has legal options if Tesla isn't forthcoming, he said, but those take time and taxpayer dollars. The NTSB, he said, has never been focused on publicity, and it has the authority to investigate new technology like Autopilot. "If anything, the NTSB is shining a spotlight on Tesla because of their innovation," Friedman said. Consumers Union has called for Tesla to stop testing the cars with its buyers, and Friedman said the company shouldn't use the name Autopilot because it implies that the cars can drive themselves. "You should name it so that it is clear what it can and can't do," he said. In the crash that killed Huang, a Tesla spokeswoman would not directly answer questions about why the SUV didn't spot the freeway barrier and stop before the collision. The spokeswoman referred to a statement saying that Tesla owners' manuals have warnings and notifications stating that a driver should not depend on the car's autosteer system to pick the right driving path. It also says automatic emergency braking "is not designed to avoid a collision and is not a substitute for maintaining a safe traveling distance" from other vehicles. In its statement Thursday, Tesla accused the NTSB of focusing on the "safest cars in America" while ignoring less-safe vehicles. Tesla says there is one auto death in the U.S. for every 86 million miles driven, but for Tesla vehicles, it's one death for every 320 million miles. The NTSB makes recommendations to prevent crashes, while NHTSA has authority to fine automakers, push for recalls and seek regulations.